This week marked the beginning of our final week at school, which was a thought that made us all very emotional. Monday’s Grade 4 lesson was all themed around space, so we tried to make the lesson as creative and interactive as we could-we knew that the kids enjoyed the last lesson where we had done this. We showed them some different facts about space and then asked them questions about these facts and they ran to the table which had the correct answer on. Despite not quite understanding what they were supposed to do on the first one (which resulted in them sitting down in their usual places!) they got the hang of it by the second question and loved running around the room. We used the interactive whiteboard for this lesson and used a PowerPoint with the facts on, which the kids all found extremely exciting and this incorporation of technology also served to show the teachers how they can utilise this new and exciting equipment. Continuing on with our space theme, we have given the teacher some lesson sheets that we didn’t get the chance to use and she seemed thrilled at the idea of being able to teach a more engaging lesson in the future. We’re hoping that our ways of making the lessons interactive and creative for the kids will be something that the teachers carry on doing once we have left, and seeing the teachers’ enthusiasm about our lessons is giving us hope that they will carry on what we have started. In grade 6, the order of the day was ‘Global Warming,’ myself and Phil relishing at a science lesson (finally). As such, we set out trying to make the lesson as interesting and as engaging as possible. Considering the subject matter, this was a greater task than first imagined. I set out drawing a rather haphazard Earth and atmosphere, cute drawings of penguins by Caitlin followed and colouring sheets were created. Surprisingly, no matter the age of the children, the prospect of colouring in would never fail to entice. However, there were a few unexpected challenges, such as explaining the greenhouse effect when the idea of a greenhouse itself was a foreign concept. Though, after a considerable amount of trial and error, we were able to liken the theories to things they knew and gradually they began to understand ‘the Earth heating up is bad’ ideology. On Tuesday, we had the opportunity to go hot air ballooning in the Drakensberg mountain; I however was reluctant to go, but eventually gave in after much persuasion and even though we had to wake up at 5 in the morning (freezing cold) we were all still excited and raring to go. We were greeted by the pilot and his team with cups of tea and biscuits around a fire while they inflated the balloon. After a couple of minutes, we were ready to go, I was amazed by how tiny we all were in comparison to the massive balloon…I guess that’s how Daisy feels every day…just kidding J. It was quite cool to see how quickly we managed to get up into the air as Raymond and the rest of the team became ant-like. 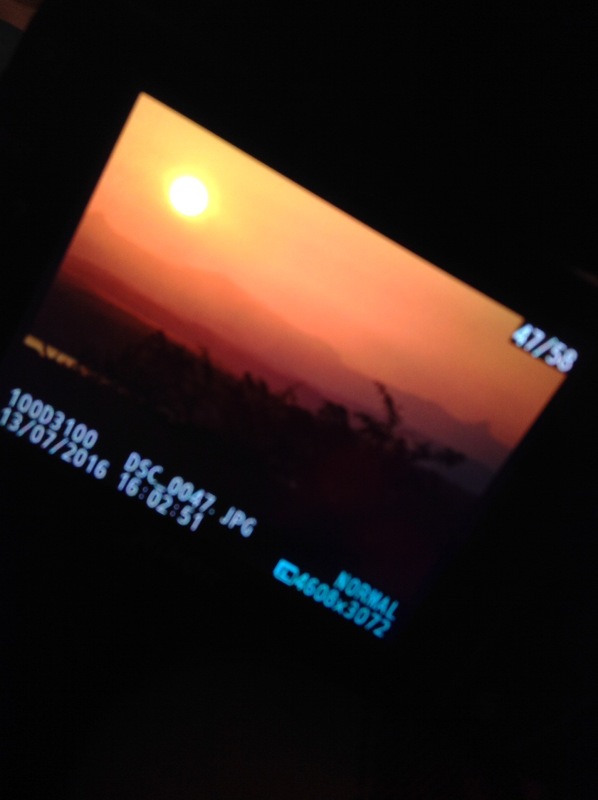 As we kept escalating above the trees, the sun hit us as it was rising with the Drakensberg Mountains in the background. As we climbed higher, I tried to relax and enjoy the ride but I couldn’t help but think that there’s nothing more comforting than a thin plank of wood standing between me and about 1000 feet to the ground, and it didn’t help that the sound of the booming fire from the fuel lever made me jump every time the pilot pressed it. Having said that, the view was very nice with some snow still sitting on the mountain tops and in no time at all, we were ready to land back on the ground. The funniest moment of this whole outing would probably have to be when we were all climbing out of the basket and Kathryn (one of the lightest) was the last one to exit, instead of the basket staying on the ground like for the rest of us, it decided that it wanted to drift back up into the air and all we could see was Kathryn’s head perched on the side very confused, and like the responsible people we are, we helped Kathryn by laughing our heads off. To top it all off, we were met back at the ballooning site with a cooked breakfast overlooking the mountains and river. On Thursday we were invited to attend a primary school in Bergville to show the difference in the standard of education. It was lovely to see, as the grade 1 class I was in were taught in English as though it were their mother tongue and Zulu as though it was an additional language. The kids were a lot more advanced in both English and maths and, may I add, more well behaved! We spent the morning there and thoroughly enjoyed shadowing the teachers of our classes. In my class the teacher, Monique, asked me to sit with a little boy to help with his mathematical skills. (I have no idea how to spell his name!). We used his colouring pencils to represent the number physically to help him take away a smaller number from a bigger number. He was very cute and was very happy when his hard work earned him a sticker and a potential lollypop at the end of the week. There was a break from 10-10.30 where we were able to get a lovely cup of tea and play with the kids until their Zulu lesson. Unfortunately I’m not quite fluent in Zulu yet so I had 45 minutes to kill and decided to spend this time reading in the sun with another cup of tea. We couldn’t quite comprehend that our last day at the school had finally arrived. However, despite the variety of emotions felt, we all agreed that it was crucial to make today memorable for all the right reasons. We went into the school with smiles on our faces and with exciting lesson plans in our bags. Although all the kids are balls of energy, we thought it would be a real treat to buy lollypops for the entire school-this involved a purchase of 250 lollies, an amusing feat in itself, but the sheer excitement on their faces was 100% worth it. In Grade 1, we printed off a stencil of the Arden Academy logo and allowed the class to colour it in-always a creative task. We ended up with some very colourful emblems, some so inventive that I think Mr Murphy should consider modernising the current badge. Additionally, we decided to wear our South Africa t-shirts so that the children could sign their names on them in farewell; a prospect which proved greatly exciting to all grades. Children crowded around us all, desperate for a sharpie, some drawing wonderful pictures on us and others leaving thoughtful messages. More often than not, children scribbled on us more than once! Break times were of course spent with the children. We all thoroughly enjoyed racing around after them, sitting on the climbing frame, monitoring them on the trampolines and venturing onto the monkey bars. Many a photo was taken today, as we began to say our emotional goodbyes. However, for me, the highlight of the day was the beautiful farewell ceremony organised for us by staff and student alike. It involved performances and speeches from each grade, truly demonstrating the extent of our influence among each year group and even individuals. The staff were kind enough to give us gifts as appreciation of the work we have done for the school and also to represent the importance of female empowerment, the historic reason for the public holiday fast approaching on Tuesday. As a group of six girls, the message of the gifts resonated and also complimented our educational endeavours in the school. We all received individual beaded South African hairbands and t-shirts, incredibly generous tokens which we didn’t expect but all greatly appreciate. We have all absolutely loved my time at the school. Not only have we learnt more about ourselves and the type of people we’d like to be, but we’ve also thoroughly enjoyed bonding with all of the children, who are just such amazing and happy individuals. You never really understand how fortunate you are until you immerse yourself in a completely foreign situation, which all six of us have done by embarking on this trip. I cannot thank the school enough for this fantastic opportunity and I really hope that we have left the kids with lasting memories, but also the belief that with education, they really can do everything they dream of. Thursday the 28th of July was the day of Kathryn Frances Green’s 17th birthday and so the day began with a chorus of ‘happy birthdays’ far too early in the morning and a lift in the game drive down to the school. After having been eagerly awaiting the football and netball posts (they had been due to arrive on the Monday with the trampolines), it was such a relief when they greeted us at the school gates; ready to be assembled when the assembling team arrive. Given the fact that it was Kathryn’s birthday, we all felt it appropriate to spoil our Grade 2 and 3 with a slice of cake to celebrate however, as there are 45 grade 2 and 3s, we did have to overcome the hurdle of somehow cutting these cakes into such a huge number of slices. Thankfully, due to some expert cake cutting skills, we overcame this and after a quick English lesson on which ingredients make up a cake, the cake was whisked into the hall to a symphony of cheers. It was an incredible privilege to hand out the slices of cake to every beaming child. Dizzy with excitement, they seemed to believe that one should wear cake on the face rather than eat it, so we were left with quite the mess created by some very hyper children. Despite the chaos, we had a lot of fun. Thursday also brought a new challenge of teaching the older years. Daisy, Kathryn and I took on Grade 4, teaching them the past tense, and Phil, Caitlin and Becky taught Grade 6 all about synonyms and personal pronouns. As a result of the fact we had been teaching children who were below the age of 10, it was refreshing to teach a class where the language barrier was not so difficult to overcome and we were taken aback at how quickly they grasped our activities and understood the past tense. Again, we found the whiteboards a handy tool for allowing the children to engage and interact with us as teachers rather than copying from a board, which they are so accustomed to doing. Impressed by their knowledge that adding ‘ed’ onto the ends of words creates the past tense, we set out to develop their knowledge by challenging them with verbs that do not fit this ‘ed’ rule; verbs such as to think or to go. To do this, we made fortune tellers with them which, when you lifted up the flaps, revealed the past tense to a more difficult present tense verb. We had been told by the teacher at the beginning of the lesson that three children were unable to read and write. Naturally, given our schooling, we were quick to show our concern and asked if these children would benefit from extra one to one teaching with us during the lessons. We were shocked when the teacher told us to just leave them, insisting it was fine for them to just copy off the other children around them. What was really nice to see is that one of the boys, who was unable to read and write, really enjoyed our creative aspect of the lesson and made the fortune teller perfectly; folding the corners incredibly neatly. We all saw that his strength lay in creative tasks rather than the academics which, unfortunately, the school system doesn’t develop due to the rigid textbooks. When we teach another Grade 4 lesson, we all agreed we want to try and encourage creativity in learning so that the children who struggle with academics can understand and aren’t left behind. The teacher was impressed with our lesson and we hope we helped, and will continue to help her develop her teaching to allow it to reach out to all children in her class regardless of their ability in academics. After a very hectic lunch with far too hyperactive children, it was time for our grade 6 lesson. The lesson however, was shortened to only half an hour to allow the teachers to give out some of the clothes we brought over for the children. There were masses of grades clambering for the clothes- each extremely appreciative, running around and waving their new top or shorts in the air. When the lesson finally began, we were shocked by how low their ability was compared to what the textbook suggested; their grasp of synonyms was such that they would suggest happy for sad and laughing for crying. They also seemed confused when asked to answer a question of their own accord, as they were so used to simply copying from the board. To make the lesson more interactive, Caitlin decided to use a tennis ball and ask the child who caught it to give an answer. This really interested the children and slowly the answers began to improve. However, what really stuck with us was the age of the children, for some of them were a lot older than expected. Considering that grade 6 is equal to an English year 6, a few of the kids were over fourteen years old. However, their ability in no way reflected that, and as all their lessons would be taught in English at this point, there would be little hope for them to succeed in any academic lessons. To celebrate my birthday in the evening we had my favourite dinner, steak and chips, on Thursday evening followed by a very tasty chocolate cake with some very large makeshift candles! Continuing with the birthday celebrations, on Friday evening we all went out for a meal to celebrate both mine and Daisy’s birthdays where we had some lovely food, despite us all being rather tired! After the trampolines had been installed on Tuesday and the dirt cleared, Phil, Caitlin and Daisy took the Grade 1s outside to have a go on the trampolines and they absolutely loved them! The joy on the kid’s faces as they stepped onto these intriguing bouncy things and started jumping was extremely humbling and once they’d figured out how to use them, they were doing seat drops and flips all over the place. As well as the kids using the trampolines, we brought in the suitcase full of clothes for the kids and we were again reminded of how appreciative the kids were with receiving new clothes. They threw on the sports kit and jumpers with such big smiles and it was extremely touching to see how much a single top, or even a pair of pants, meant to the kids. Seeing how much of an impact the resources we have provided the school with has been extremely humbling and has extremely impacted us all. Yesterday was Daisy’s birthday and so we spent the morning learning all about the Battle of Spionkop with Raymond on his tour. We were all fascinated in what he had to say and found it very interesting to hear about how much history the area we have been staying in for the past few weeks holds. After coming back to a very warm day at the lodge, we had lunch and surprised Daisy with a lovely vanilla birthday cake, except with real cake candles this time! We also ended up sharing the cake with Holly, one of the dogs at the lodge, as she managed to get into the kitchen and ate some of the cake! Thankfully, there was still a big enough chunk of the cake left that we could have another slice each, as well some of the chocolate cake left to eat! Lastly, I’d just like to apologise for the latest blog post as there seems to be half of the blog post about the Drakensburg boy’s choir missing. I’ll try and sort it out as soon as possible for you all but I hope you enjoyed the post anyway. The wifi has also been a little temperamental, hence why this post has gone up quite late, but we will still try and keep updating it as much as possible. Due to the recent freezing cold weather, rain and the schools lack of heating, we decided a more creative lesson was in order. As such, we spent our evening hand-cutting forty eight triangles for the children to decorate the next day. A slight hitch in our plan: what with our usual classroom (the field) being rather wet and cold, we used the only slightly warmer church hall. After digging out some old tables and chairs we had a just about serviceable classroom and set about handing out the pens. Considering the joy that follows a normal biro, felt tip pens and stickers caused an uproar. The children also seemed unable to comprehend that they could draw whatever they wanted. After writing their names they waited for further instructions, as unusually there was not a board for them to copy word for word, after realising the little slip of paper was completely their’s they were off, covering not only their work but us as well, in stickers. After then spending the evening sticking these forty eight triangles onto some bunting, we brought it in to show them what they’d made. Oddly, they seemed completely shocked to see their own work displayed, and twenty children continued to charge towards us, pointing and yelling about which one was theirs, to the point where we had to swiftly stuff it back into the bag so they didn’t completely destroy it. Grade 1 have a very exciting week planned ! Caitlin, Phil and I have decided to show the children the world, a rather ambitious plan, but one I feel is currently proving rather successful. We have decided to explore a variety of countries from different continents, eventually deciding upon the UK, the USA, China, Australia and finally, South Africa. We have kickstarted the week with the UK, which made us all feel rather nostalgic as we discussed the stereotypes of Britain: the Queen, red buses and of course, tea. We taught the children the song ‘London Bridge is Falling Down’ and after many shaky starts, they were singing it all the way through, impressing us to the point that we all considered leading a school choir. This lesson involved my terrible attempt at drawing the UK (minus an atlas) the outcome of which is pictured below and probably shames the Geography department. Tuesday’s winds brought the USA to the classroom, where the children were transfixed with videos of American football and basketball, cheering and laughing even in inappropriate moments. In order to excite the children for the following countries, we hung bunting up in the classroom, each flag bearing a letter which would form the name of the country when hung up. It was a struggle to untangle the piece of string hanging above the room and when we finally managed to, the wind was so strong that the letters blew all over the place, much to the children’s amusement! Today’s lesson was on China, and such teaching of course requires relevant clips from Kung Fu Panda, which the children delighted in. It really is powerful to see how much joy an interactive whiteboard can bring to lessons and its influence upon consequent learning. We even taught them a few phrases of Chinese, resulting in slightly adventurous pronunciation, but with a definite feeling that we were expanding their horizons. Their textbooks are incredibly basic and just for a week, we want to allow them a slight educational escape in learning more about the world outside of their school because that’s the world they could end up exploring and even influencing. For Thursday and Friday, we are covering the animals of Australia, the beauty of the Great Barrier Reef and the enriching culture of South Africa, an aspect which we hope the class will add to in order to support the learning occurring on both sides of the classroom! Despite Kathryn’s considerable panic, the trampolines finally arrived and were installed. Unfortunately due to the poor weather- it has been the coldest weather in eleven years (of course when we’re here) the children have been unable to use the trampolines. However, when the weather heats up they will finally be able to explore these new and exciting bouncy things. This afternoon we went to see the Drakensburg Boys Choir, not really knowing what to expect we took our seats and waited for the show to begin. After a mixture of both film scores, worldwide music and more traditional chanting and folk songs the performance was over. Suffice it to say the two hours flew, leaving even the most cynical among us wishing to return next week to see the exact same performance. After our first week at the school, we can all agree that the sheer gratitude of the children at Schitsdrift is what has taken us all aback. The simple act of giving one of them a new pencil sparked excitement amongst them. One of the children in grade 1, Zifiso Xaba, approached me just to say an emotional thank you for the new HB pencil I gave him. Another major moment in the week was when we gave the grade 1 class some new colouring pencils and pens. Considering they had been using tiny broken crayons before these, the excitement was unimaginable! We spent the second half of our English lesson on Wednesday colouring in primary and secondary colours and matching up the names to them. Unfortunately, a few in the class were so excited about the prospect of the new colours that they continued to colour the paper in every colour imaginable and not necessarily in the right box! After teaching an impromptu grade 2 lesson on Tuesday, teaching the grade 2’s after the grade 3’s every day became a regular occurrence. We found a spare room to teach in which meant we could use a big whiteboard to showcase Liv’s amazing drawing skills in drawing a body for the kids to label which they really enjoyed. They got so excited about it that they stood up and shouted every time we asked them to name one of the body parts! The first week has been challenging, especially due to the language barrier, but extremely enjoyable and we have all got a lot out of it. Saturday brought our first lie in all week…well 8.30am lie in anyway! We were given the amazing opportunity to travel to the Nambiti game reserve (just past Ladysmith) to do a three hour game drive. Our tour started at 3 and we were introduced to our ranger, Martalise, who said she’d try her hardest to show us the big 5 even though the Leopard is “non-existent” for her! We were greeted with Warthog, Kudu, Impala and Wildebeest. After our midway drink stop looking over the reserve, Martalise got a radio call to say Rhino had been seen close to the road. We made our way there as fast as we could, ignoring the state of my, Becky’s and Daisy’s spines as we were sat up in the back of the Jeep. However, the sight we arrived to was absolutely amazing. A mother and calf were there, closely accompanied by two adult males, the younger estimated to be her previous calf. We sat there for a while in total silence as we watched the peaceful and majestic animals in front of us. Just as we thought it couldn’t get better, we got another radio call on our way back saying two fully matured adult male lions could be seen on one of the hills. We got there swiftly, where we could see two black manes sat among the long grass enjoying the view over the reserve. They were a little way away but the cameras picked them up rather clearly and we could watch them through the monitors. After the lions, the remainder of us got our ponchos on, which were just like fluffy warm blankets, and we drove back up to the Springbok Lodge for a well needed toilet stop and warm drink! Armed with a box of whiteboards, we walked into school feeling a little more prepared yesterday morning! Becky, Liv and I took the Grade 3’s outside to do English again, but with a plan and our extremely helpful whiteboards, the lesson went much smoother and we felt a lot more prepared. The kids absolutely loved using the whiteboards during the lesson and it made it a lot more interactive. We arrived back at the lodge briefly to have some lunch and then set straight out to go on a game drive around the reservoir. We rode round in the typical safari truck, which was very exciting in itself, and despite it being rather dusty, it was completely worth it! The first animal we saw was a zebra which meant all the cameras came out and excited us all very much. Driving round we saw deer, wildebeest, as well as rhinos and giraffes! The baby giraffes were the most adorable things and seeing all the animals close up was such an incredible experience; words really can’t describe it! Not only did we drive around the game reserve, but we actually spent the night camping there! The initial worry of seeing giraffes and zebras in the campsite was quickly gone away as soon as we’d settled in and were sitting around the fire (wrapped up in several blankets). We had some lovely food cooked for us and then sat around the campfire toasting marshmallows, although there were more burnt ones than those that were nicely toasted! I particularly enjoyed the marshmallows and, being the messy eater I am, got marshmallow all over my fingers and face! Despite it being a rather cold night, the sunset and sunrise were both worth it. Today we had another impromptu lesson as the teacher asked us to take the grade 2’s out to do an English lesson whilst she taught the grade 3’s in Zulu. Seeing as the grade 3’s seemed to love the whiteboards so much, we decided to use them and they worked a treat as we expected! 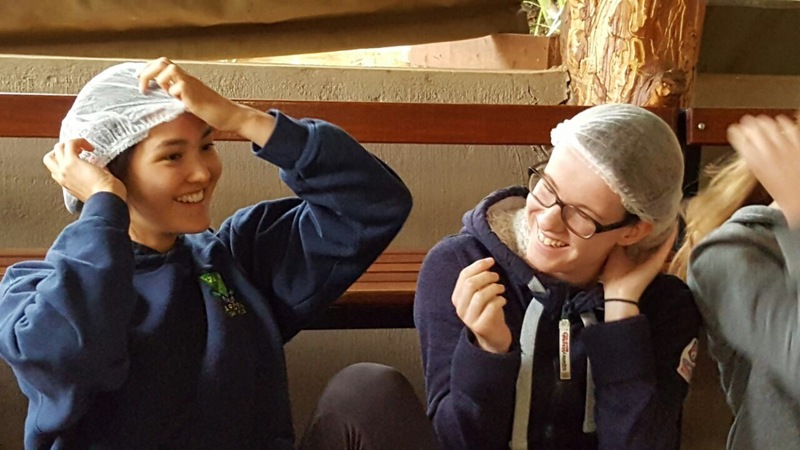 We left school earlier today as we went horse riding in the game reserve, meaning a return of the flattering hair nets before putting on the riding hats! Once we had mounted our horses, we were off riding through the reserve. Phil was particularly excited about the riding, being an experienced rider, and was very excited about leading us all and found it particularly amusing when we were attempting to steer the horses in the right direction! Unfortunately for me, my horse was slightly smaller than everyone else’s and got a bit excited when Liv’s horse started cantering, so naturally decided to follow – forgetting that she was slightly smaller than the others. This meant that I was bouncing so much that I fell off! Thankfully there was no serious damage done and I only got a few cuts and scrapes, even if they did sting a bit! Lynette treated us with a special dinner out tonight which we all thoroughly enjoyed, eating steak, pasta, pizza, and brownies which made us all extremely full, despite being absolutely delicious! 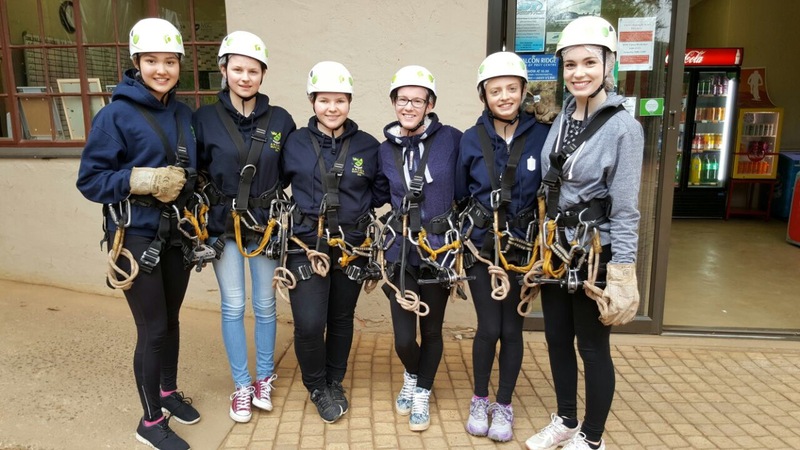 Yesterday, we visited the Drakensburg Canopy Tours, a series of zip lines through the woods and valleys of the Drakensburg Mountains. After donning some extremely fashionable hairnets and not at all uncomfortable harnesses, we made our way to the first drop off point, marked by local landmark ‘Barry’s Grave.’ Our guide informed us that Barry was a famous mountaineer who met his fate when his climbing equipment failed. Knowing that our lives were to be in the hands of this now questionable climbing equipment, we walked (slightly unnerved) down to the first zip line. 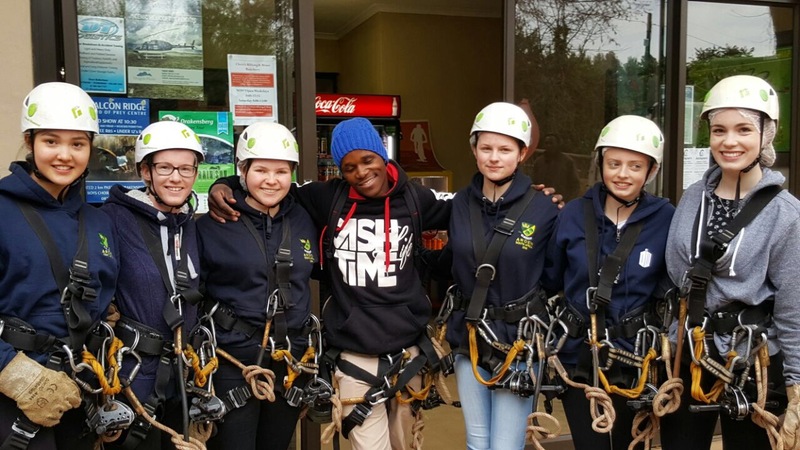 After some smaller slides (zip lines) and a few painful jumps, we reached the longest and fastest zip lines in South Africa, going across the rocky valleys and through woodlands 65 metres above the river below. Today was our first day at school and extremely nervous, we bundled into the car for the short drive down to Schitsdrift School. We were greeted by Miss Welcome, the aptly named Headmistress, split into groups of three and were thrown immediately and completely unprepared into the classroom. Liv, Kathryn and I had grades 2 and 3, as due to recent government cuts the school cannot afford a teacher for each year group, meaning they are forced to share-leaving the teacher in a very difficult position of trying to teach two completely different lessons simultaneously. Following a short break of Tig, we decided to take the grade 3s outside for a spontaneous English lesson. Without any sort of plan and whilst trying to navigate the considerable language barrier, we chanted and clapped our way through a few pages of their textbook. The lesson however, was made much harder simply by the lack of basic necessities, large groups of children sharing a single broken pencil, or one child biting his rubber into smaller pieces so all could have one. This was an extremely humbling experience and contrasted so much with the sheer happiness each child showed. Phil, Caitlin and I took Grade 1, initially a daunting prospect, however as the day progressed, it became clear that this was an amazing opportunity we wouldn’t forget. Their first lesson was Maths, taught in their native language of Zulu, but this didn’t stop us from involving ourselves in the marking of their work. We ourselves took the second lesson, and my legs were shaking as I assumed my position at the front of the classroom. We were given an incredibly basic textbook with which to work, however we soon turned this into a positive, as it gave us increasing leeway for creativity. Despite initial barriers in communication, the class were soon on their feet, excitedly chanting words like ‘table’, ‘chair’ and ‘pencil’ whilst pointing at the objects themselves and fully cooperating in all activities we conducted. At lunch, we were thoroughly involved in games of ‘Tig’ and Zulu singing games, which proved culturally enlightening. 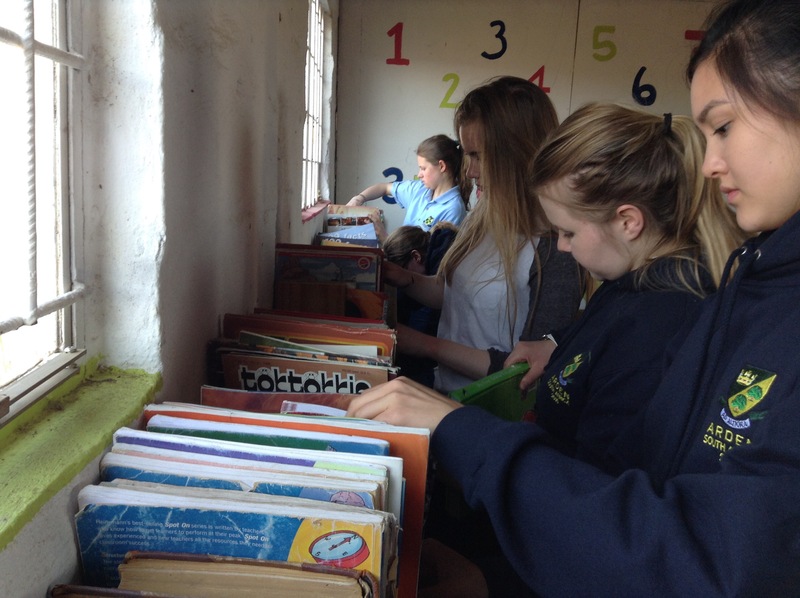 The last part of our day involved tidying the school library, a shaded room filled with books of all kinds, but a room incredibly different from the libraries we are used to. The books cover a large breadth of topics, and I’m proud to say that those we will provide for the school during our time here will contribute to the mass of knowledge the room holds. Overall, our first day was challenging, but also such a wonderful day where we all learnt more about ourselves and truly began to understand the giving nature of the local community. Yesterday, we got the chance to go to a Reptile Centre and considering some in the group are petrified of anything that crawls, you would think a trip to the reptiles wouldn’t be a walk in the park. However, the kind nature of the guide and the prospect of being able to hold a Chinchilla calmed many nerves. As we walked round the small centre we were introduced to Burma the Burmese python, who was very heavy to hold, and we were also introduced to Barry the Puff Adder whose name really didn’t make him any cuter no matter how hard the guide tried. Stinky the Ferret was also a contender, who suited his name incredibly well. Unfortunately for me, I was so quick to hold him I learnt the hard way of his name’s origin! Today, we went on a 12 kilometre hike in the Drakensberg Mountains and despite being a tough walk at times, we were well rewarded with some of the views whilst walking up! The climb involved various different terrains, including walking in the middle of crop fields, wondering if we were going in the right direction. Unfortunately for Becky, Daisy, Liv, and I, this happened to be true as when we finally found an actual path we thought that the rest of the group had gone down it when really they had gone up it, so we ended up in the forest at the bottom of the path wondering about the lack of path ahead. The appearance of animal tracks were also unnerving! Thankfully for us, after some panicked “hello’s” into the wilderness, the rest of the group heard and managed to call us up in the right direction before we got attacked by ravenous baboons! Cheers Raymond. The walk was getting a bit much for Liv! We made it! After being somewhat awake for over 24 hours, dubiously chewing our way through the plane food concoctions and attracting the stares of many whilst sprinting through Frankfurt Airport, we finally crunched up the driveway of the beautiful Spion Kop Lodge. We received a friendly welcome from lodge dogs Rosie and Holly, so enthusiastic to our presence that they jumped into the car before we even had time to remove our bags. Mere seconds later, we met the lovely Lynette, our South African mother, with numerous homemade, tasty juices in tow. Our rooms are spacious and all with their own individual, homey twists. Dinner consisted of a tasty butternut squash soup, a succulent steak accompanied by potato, coleslaw and beetroot (courtesy of the legendary Raymond) and to finish, a syrup sponge. It was Daisy’s first time eating a steak, and we collectively decided this meal sets the bar for any future steak endeavours. This place is an absolute paradise. With panoramic views of the Drakensberg Mountains and one stunning sunset frantically photographed, I think it’s safe to say we’ll all be calling Spion Kop home in no time. On Sunday 15th May, our local fun run (Knowle Fun Run) was held and we took the most of this opportunity to do some fundraising for this trip! Kathryn and Caitlin, along with the Mums of Daisy, Kathryn and Emma, “ran” the fun run with buckets collecting money along the way. I mean it was more of a walk/slow jog really (! ), but we still did it and managed to raise £116.50 from people cheering us on along the way! We also had a stall at the fun run where we did face painting, temporary tattoos, and ‘Splat the Rat’ which combined raised £120.85! The Fun Run was also our date for the draw of our big raffle that we have been selling raffle tickets for for a few months which in total has raised over £1,000! Congratulations to the winners of the prizes as well! Thank you to everyone who donated for both the Fun Run and the raffle, your generosity is greatly appreciated by all the girls! Hi and welcome to our blog! We are a group of 7 girls from Arden Sixth Form, Knowle and we are going to South Africa this summer for 4 weeks to teach in a rural school. For more information about our trip go to our “About” page. Thank you for visiting our blog, we will be updating this blog whilst we are out in South Africa to keep everyone updated on what we are doing!